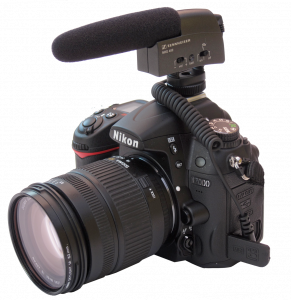 First thing to establish about recording movies on your DSLR, as you may have experienced, is that the internal microphone is next to unless and the recorded sound can only be really used as a guide track. This isn’t to say that the mic is awful quality or the recording system itself isn’t up to scratch, but the fact that the omnidirectional mic is built into the camera body, picking up every hand movement, the focus servo and your heavy breathing!!!! So the first choice to make is which camera top mic to go for and what sort of situation it can be used in. Pictured is my brilliant new D7000 (more later!) and my Sennhieser MKE400 microphone - this is a great little gun mic, very well built, high quality sound and fairly directional - i.e. looking forwards from the camera in the direct you’re shooting. The rubber shockmount also separates the mic from the camera body fairly well. 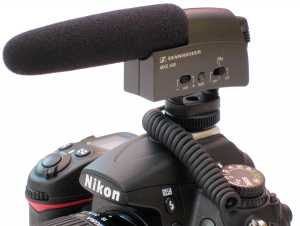 The MKE400 is a petit self powered gun mic perfect in size to sit on top your DSLR and not get in the way. The hotshoe camera top mic is only ever going to pickup general sound or atmosphere, you can’t expect it to focus in on someone speaking a distance away - you need to get closer or move a mic closer to the sound source - just like you were moving in to take a portrait. There are other self contained camera top mics like the Rode Videomic, but they’re not half as well made, large, plastic and have a tendency to fall apart. The Sennheiser MKE400 is also much smaller than the competition, the last thing you want is for the mic to get in the way of shooting the pictures! Professional microphones are usually Phantom powered, they need power to come down the cable from a mixer or such like. This means to use most other mics you’ll need to get a sound mixer you can carry on the shoulder like the Rolls MX410 and cable to the camera via 3.5mm stereo lead. You could then put the more direction mic on top of the camera using something like the Rycote Universal kit, but you have to remember you’re going up in size which could be a problem, especially if you’re handheld. There are a few battery powered professional gun mic like the Beyer MCE86s, but obviously putting an AA battery in a mic extends it’s length by 5cm, which could mean it gets in shot. You’d probably be better off with the mic set up on a stand, or even better, on a boom pole with someone else operating and looking after the sound whilst you do the pictures! In the end there’s no substitute for a Sound Recordist!